Showing search results for Similes About Bullying. Bullying is never right. Think carefully before you insult somebody for who they really are. At least they're open about it. Calling someone fat, won't make you skinnier. Calling someone ugly, won't make you prettier. Calling someone stupid, won't make you smarter. Calling someone a loner, won't make you more popular. 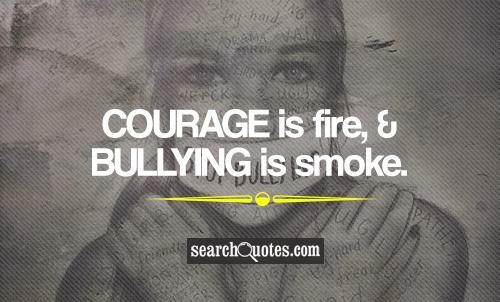 Bullying someone, won't make you a better person. Drama is Drama. Bullying is Bullying. No matter what reasons people do it for, it will usually be out of self-interest or for their own enjoyment. One day youll look back and realize how you treated me and maybe, if you finally grew up you might actually feel bad about it. In school they call it Bullying but at work they call it Upper Level Management.